FFWPU Kiribati: On August 14, we met Kiribati’s president, Anote Tong, in his office in the Parliament Building and explained the significance of the Peace Road project to him. After the brief explanation, he wrote a message and signed the Peace Road 2015 banner. He also signed 3 different colored T-shirts and a soccer ball. He wished for the peaceful unification of North Korea and South Korea, based on the vision of Rev. Sun Myung Moon. Hon. Tinian Reiher, Minister for Fisheries and Marine Resources Development, an Ambassador for Peace and a good friend of UPF, signed the Peace Road banner. Hon. Pinto Katia, Minister for Commerce and Industry and Cooperative, who recently became a friend of UPF, was also present at the meeting to sign the banner and say a few words about peace and love. On August 15, Mr. Fakaofo K Sione cycled 40 km from the Bonriki International Airport to the national stadium. 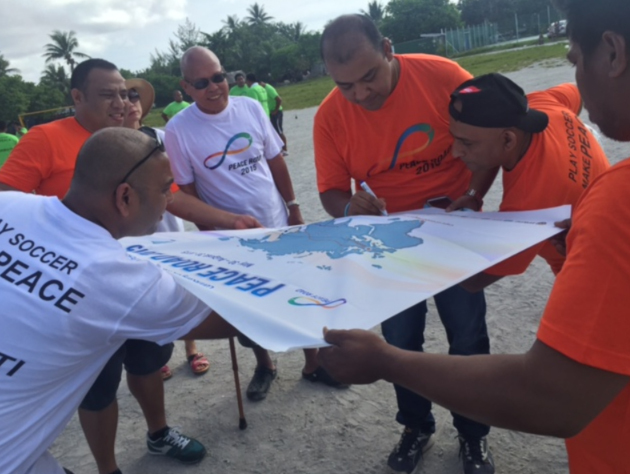 House Speaker Thomasi Uta, who is also the UPF president of Kiribati and the Minister for Commerce met Mr. Sione as did the staff of ANZ Bank Kiribati, including its CEO, Rufus, the staff of National Telecom Kribati and its CEO, Mr. Kamlesh Sharma and twelve local cyclists. After a welcome ceremony, we had a friendly soccer match between staff of members of the two businesses and their CEOs. 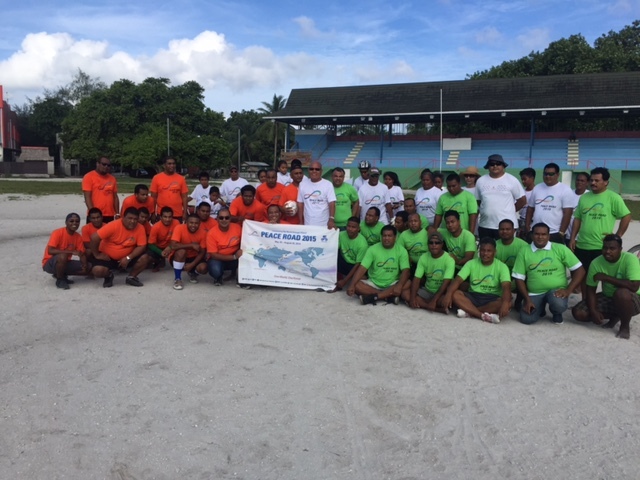 An attraction of the program was Minister Pintos, who played against the ANZ staff. He used to be the CEO of National Telecom. 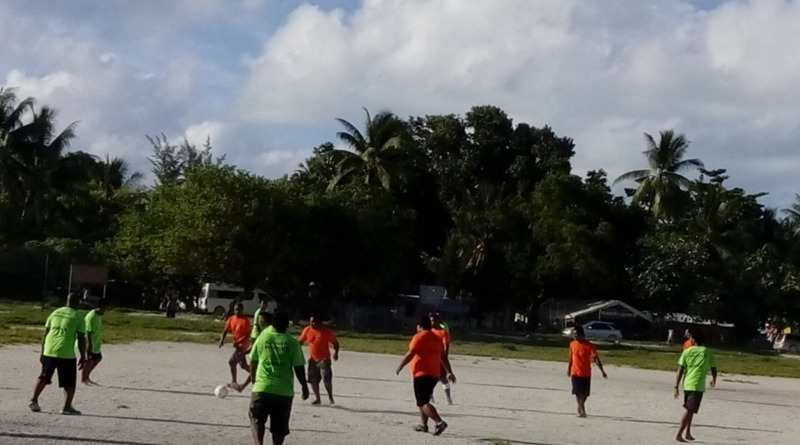 Ms. Grace (her English Name), the only Korean citizen residing in Kiribati was also present during the soccer match and signed the Peace Road banner. 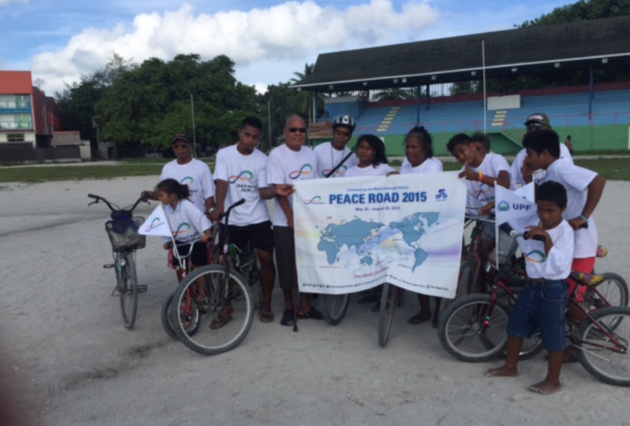 After the Soccer matched finished Mr. Fkaofa, the cyclist, cycled back 40 km to the international airport with the Peace Road Flag and T-shirt.